Polyhedron Collider: Casual Game Insider is currently raising funds on Kickstarter, so what is it and what’s it all about? 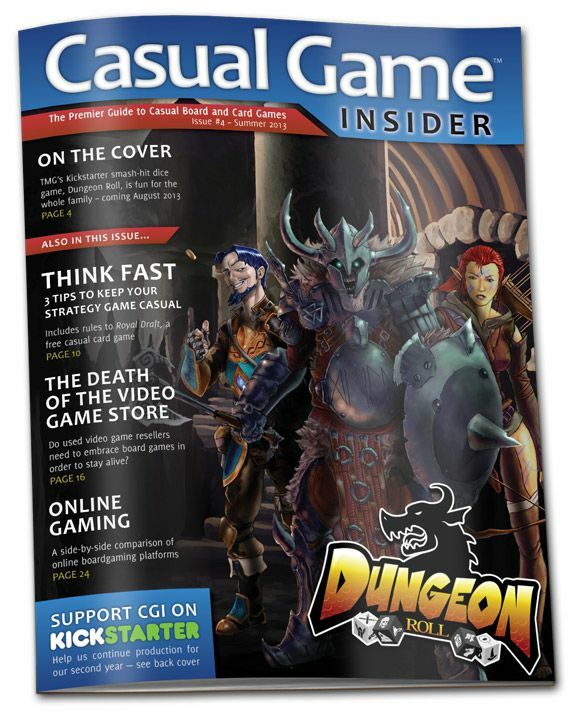 Chris James: Casual Game Insider is a quarterly magazine that focuses strictly on casual board, card, and dice games. Each issue has news, reviews, and interesting articles. It has been in production for one year now and was launched to fill a specific need in the industry. 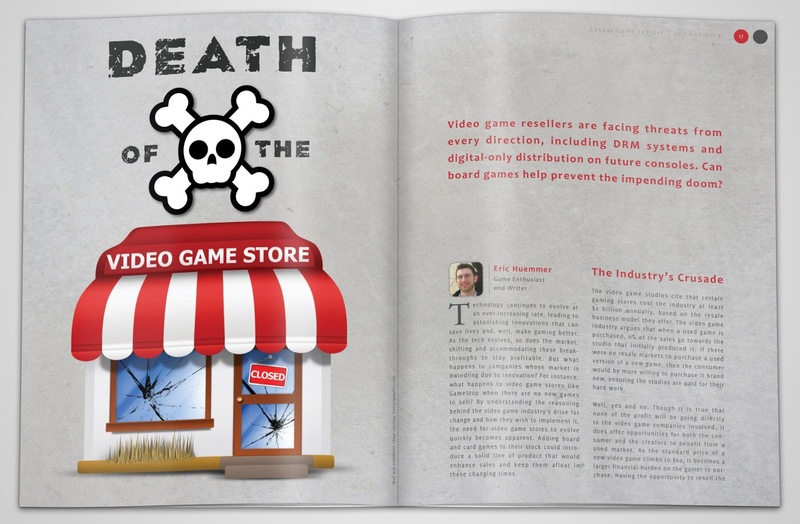 It really is the only magazine of its kind, and it is a good resource for gamers to share with their friends and for retailers to share with their customers. In our first year, we have seen a lot of success. We have received very positive feedback on the design, content, and direction of the magazine. We have also grown enough to reach 2,000 game stores with the help of 3 major game distributors. It has been rewarding to see it come together so well and we're excited to continue forward with production. Now that our campaign has fully funded, we hope to achieve our stretch goals, which will allow us to expand our content, add interactive content to our digital editions, and reach even more retailers. Polyhedron Collider: Board Games come in many shapes and sizes, what made you want to concentrate on casual games? Chris James: I am a casual gamer, myself. I love casual games and I believe they are a wonderful tool to help build families and friendships. After playing a few of the common "gateway" games years ago, I was floored and wanted more. Unfortunately, "more" seemed to mean deeper, heavier, and often darker games that I simply was not interested in playing, as they didn't provide the same experience I was looking for. I had no idea how to find more games that I liked, and was simply overwhelmed by the gaming scene. As an entrepreneur, I decided to make the types games that I wanted to play, and thus entered the board game industry as a designer and publisher (Stratus Games). With my wife as a business partner, we saw many successes, including big sales to retailers like Barnes and Noble. We later decided that we needed to do our part to make some positive changes in the industry to make gaming more inviting to casual gamers like ourselves. 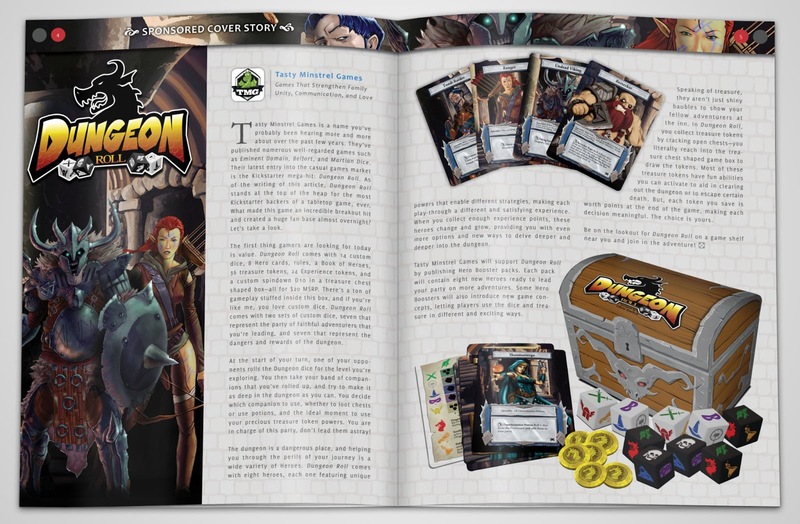 So we started Casual Game Revolution, an industry outreach arm of Stratus Games, and began work on Casual Game Insider. 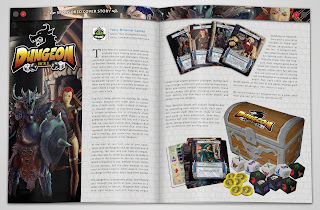 Polyhedron Collider: If you believe the media, the concept of the printed magazine is dead, and that websites are the future, so what made you decide to release a more traditional magazine about board games? Chris James: I believe the printed magazine is still alive and well, but I also believe there is much opportunity in embracing digital technologies, as well. Most of our readers prefer printed copies, but we are also working toward embracing more rich, digital content if we succeed in reaching our stretch goals. The initial decision to focus on a printed magazine came down to the need to reach retail stores with our message about casual games through the existing network of distributors. 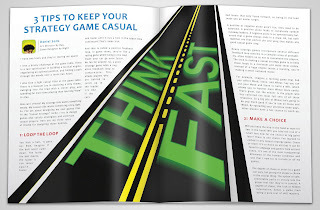 We see retailers as a key sales force, and often the first portal into the world of board games. 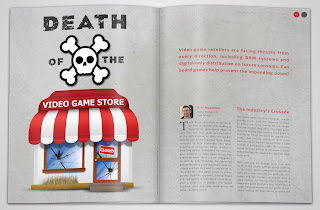 However, many stores are simply not inviting to casual gamers, and we wanted to help drive a greater focus on casual gaming. We believe a printed magazine is the best way to reach them, and we hope our magazine provides value to them as a resource to share with their customers. Polyhedron Collider: Casual Game Insider is now in its second year, what is the biggest thing you’ve learned from the previous twelve months? Chris James: Of the many things I've learned, the most important lessons are: 1) people don't always follow through with their commitments, and therefore 2) it's imperative to always have a backup plan. On multiple occasions, we had authors who had committed to deliver content by a certain date, and when the deadline came they went AWOL. They simply dropped the ball and we could no longer reach them, and thus we were faced with the last-minute struggle of finding alternative content. In the end, everything worked out well, but I have learned to identify the high-risk articles and have an alternative plan ready, just in case. Polyhedron Collider: Selling advertising space has been the traditional method of funding magazines and newspapers for over a hundred years, what drew you to the looking at Kickstarter as a method of funding and has anything about the process surprised you? Chris James: Advertising space is certainly a key aspect of our magazine, as well. We rely on our sponsors to finance the distribution of free magazines to over 2,000 stores, and the marketing value of doing so is certainly one of the main reasons they get on board. We are using Kickstarter as a pre-funding platform for both sponsors and readers to support our efforts. We need to ensure that we have enough support for a year of funding prior to making commitments. This is how we funded our first year and it worked out well for us, so we are back again. Polyhedron Collider: Last of all, what is your favourite casual game and why? Chris James: This is a tough question, as I certainly enjoy a large variety of casual games. Besides my own designs, I would say that I am very drawn to Survive, partially because it is a game I remember playing as a child. As an adult, I still like the theme and find the gameplay to be very enjoyable. A big thank you to Chris for taking the time to speak to us. 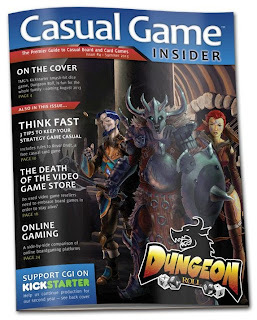 If Casual Game insider looks like your kind of thing go check out the Kickstarter. You can follow Chris on Twitter @CasualGameRev and casualgamerevolution.com.